It seems that quality coffee roasters and coffee shops these days are overrun with hipsters. Funky music playing in the background, sparsely furnished store fronts and a customer base of vintage store dressed twenty and thirty-somethings. We have been in these types of shops all over the States and now in countries like Thailand, Japan, New Zealand and Australia. I am not sure how good coffee acquired the hipster look, but in our search for the perfect cup of coffee, we finally came across a place where hipsters don't seem to reign supreme. And, the coffee is damn good. Yahava Koffee Works is a coffee roaster and storefront on the outskirts of Margaret River. Getting out of our car, we could smell the freshly roasted beans mixing with the sugar smells from the neighboring cookie shop. Green grass, outdoor tables and a serene setting welcomed us outside, and inside the atmosphere was just as chill. Families, friends and couples mixed and mingled while they ordered, sipped and talked about their weekend plans. The baristas and staff were unpretentious and ready to help with questions. Beans on display at Yahava. Yahava advertises a coffee tasting, perhaps to compete with the many local wineries and breweries in the area. The roaster's "adventure in a cup" experience allows guests to taste three different types of coffee all while learning about the origins of the beans. Learning new things like this is right up my alley so we saddled up to the tasting bar for a few sips. Adventure in a cup coffee tasting. Our pourer was either hopped up on caffeine that morning or he truly just loves coffee because he took us through an eye-opening and delicious tasting while not leaving any dead air space - filling up the time with facts and information about the coffee we were drinking and his general coffee tips. Tasting three different coffees - some single origin, others blends - we had an opportunity to really understand how characteristics of coffee can come together in your cup. Our first taste was of a single origin roast from Tanzania, Africa. A smooth, medium bodied coffee that was flavorful and easy to drink black. Adding some milk to the cup actually took away some of the flavor. Our pourer mentioned that milk can mask the flavors of a coffee and unless the coffee has strong enough flavors to cut through the milk, adding milk will take away from the richness of the brew. Second up was the crowd pleasing Romeo No. 5, another medium bodied coffee, but this time a blend of beans from Colombia, Ethiopia, Sumatra and Rwanda. Dave and I tend to drink milk with our coffee in the mornings so the strong flavors of the Romeo held up nicely with a little milk in the cup. We walked out with a bag. 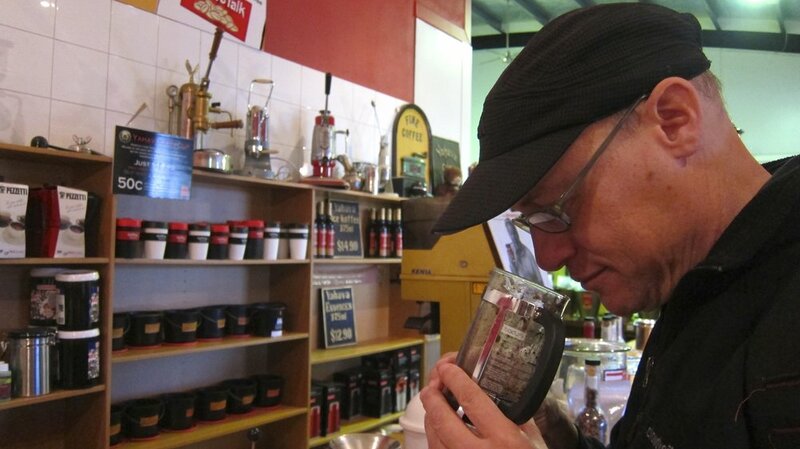 Smelling the freshly ground coffee to start the tasting experience. Our last taste was of a single origin, Kahava, from India. Strong and intense in flavor and chocolate notes, it was a delicious cup of coffee but full bodied enough that one cup would probably be enough. At home, we most often used a coffee maker, but on the road and when we camp, we use a French Press, called a Plunger in this part of the world. It can be a hit or miss coffee morning depending on if we use the right amount of coffee, if the coffee is good to begin with and if the water tastes okay. Through our adventure in a cup, we fortunately learned a few things about making a good cup of coffee in a plunger. The adventure comes to a close. The number one rule - don't fill up your plunger with boiling water. It can burn the coffee and leave it tasting bitter. As we learned, bitter coffee is just burnt coffee, nothing more or less. When your kettle of water goes off, let it sit for 20 or 30 seconds to calm down the boil. At that point, you can then pour the near boiling water over the coffee grinds in the plunger. Use the boiling water to warm up the plunger or your mugs - not to burn your coffee. After adding the water, begin to stir to mix the grinds and the water. We typically do this for a minute or so, but I'm sure it can be done for a shorter amount of time. As you stir, look for the crema to form on the top of the coffee (a pretty coffee-like foam). The crema signifies a fresh batch of coffee. If the crema doesn't appear, the coffee is old and should not be used. As we were told - "toss it out or give it to your neighbor". 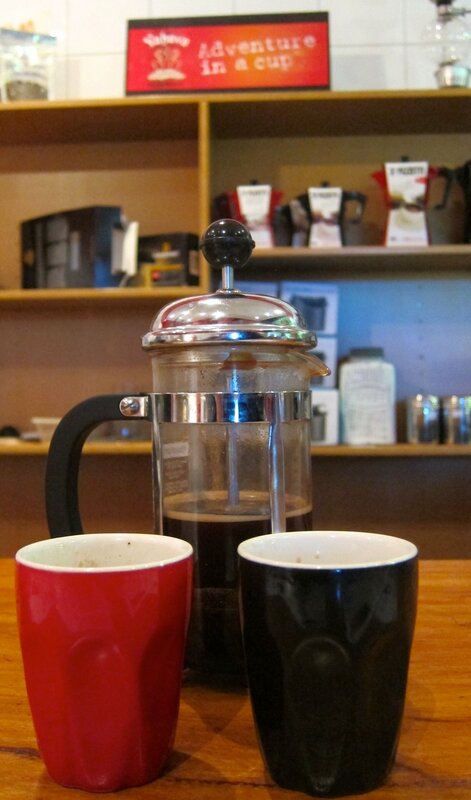 During our tasting, our pourer would stir up the coffee and immediately plunge to then fill our cups. This surprised me since I thought you should always let the coffee steep in the plunger. Turns out, it's not necessary if you stir the coffee well enough, but steeping doesn't hurt. After a few test kitchen experiments, I prefer a little steeping before pouring. Yahava is on my list of top coffee shops around the world and I am looking forward to our beans running low so we can head back for another bag. A small perk of staying in the same place for a couple of weeks.